Nazril Irham or familiar greeted with Ariel or Ariel Peterpan call born in Base Brandan, Langkat, North Sumatra, 16 September 1981. 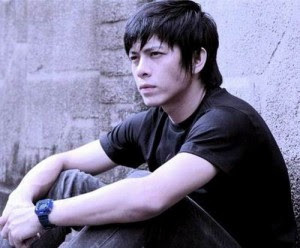 He is an Indonesian singer who is the vocalist of Peterpan phenomenal bands. Ariel is the youngest of three sisters of the Malay quarter. Ariel is a popular music group Peterpan vocalist. Ariel also noted as a student majoring in Architecture Parahyangan University, Bandung. Ariel's father was an officer in the oil field Pertamina. While his mother is a housewife ever. Because berprofesi as field officers, the father worked at the location moved around. Stay at Base Brandan few months, small Ariel and family had to move to Langsa, a town in Aceh Aceh Darussalam. Having lived there for seven years, Ariel family thus moved to Melbourne. A city Ariel udah considered as the "home" of his own. Since young Ariel saw great talent in the arts, but not in the field of singing. Artistic talents visible from Ariel precisely in the area of ​​drawing. He managed to win a few contests to draw in Bandung. Turbulence drawing hobby, Ariel sempet aspiring architects so. But, in the middle of his journey, he found a new hobby that she is doing, which is playing music. From where Ariel then ambitions and careers. Ariel had married Sarah Amalia, but is now divorced. Together Sarah, it favored daughter named Alleia Anata. Ariel officially divorced by Sarah on May 27, 2008. Since Class I junior, Ariel has an intense form bands bands. Dibentuknya first band named Peppermint. Love, luck ya band only lasted seven months. Thus, Ariel made the band again named Sliver, Cholesterol and hat. Again, all dissolved in the street. However, the latter band for meritorious lucrative career. Several people joined in, including the Ariel-hat, a consensus formed a new band. A band called Peterpan, and last until present. Together Peterpan, Ariel is able penetrate top cafes in Bandung. Peterpan the attractive appearance plus the occasional characteristic vocals Ariel secretly attracted Noey Java Jive-ex base and background so producer-to enter their songs in the compilation album The Story of 2002 Nights. Perfect Dream songs contained in the compilation album so successful for Peterpan capital to penetrate the recording industry. In 2003, Peterpan released album Sky Garden. This album turned out to explode. It should be recognized, one of the factors that support larisnya this album is vocal Ariel and its ability to manipulate the lyrics. Lyrics-lyrics that made admirers of Kahlil Gibran is very deep. Able to touch the hearts of listeners basis of her songs. Appropriate if the name Ariel skyrocketing. Position as frontman allows it appears so new idol. The climax, when the album Star in Heaven was released mid-2004 past. Ariel Bener-Bener so idolized music lovers Indonesia from Sabang until Merauke. In the flood popularity, Ariel sempet hampered problems. It digosipkan has menghamili girlfriend, a native girl named Sarah Amalia Semarang. This gossip is inevitable by Ariel. Later, it was prepared to hold the deed marry Lia. A marriage that is kept confidential from the media spotlight. Married at a young age sempet make many people doubt the survival of Ariel Peterpan career. Doubt it clearly has to be answered by Ariel. How, moreover kalo not keep drawing with a vengeance. Continue to produce songs that entertain and can be enjoyed by music listeners Indonesia. Besides berkarier in music, Ariel is now a star advertisement. It became a model Sunsilk ad joint model Amy Lee. In addition, Ariel already become popular movie star in the film Sang dreamers. Ariel play the role Arai, a young man who never stop dreaming. In June 2010, Ariel involved scandal videotape containing sexual scenes involving him with Luna Maya and Cut Tari. Council of the District Court in Bandung, West Java eventually sentenced to Ariel Peterpan 3 years 6 months, and a fine of Rp. 250 million. In that case, Luna Maya and Cut Tari be witnesses.